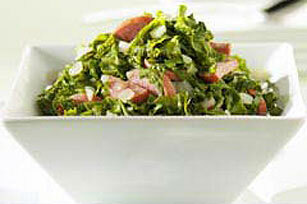 Cooked turnip and mustard greens are flavored with onion, garlic, crushed red pepper and bits of smoked turkey sausage for a savory side dish. Wash greens, removing all grit. Remove and discard hard stems. Stack greens in small bunches; roll up. Cut crosswise into wide strips. Melt shortening in large skillet on medium heat. Add onions and garlic; cook 3 to 5 min. or until crisp-tender, stirring frequently. Add remaining ingredients; mix well. Stir in greens; simmer on low heat 45 min. to 1 hour or until tender, stirring occasionally. Prepare using 6 oz. (1/2 of 12-oz. pkg.) OSCAR MAYER Natural Uncured Beef Sausage.